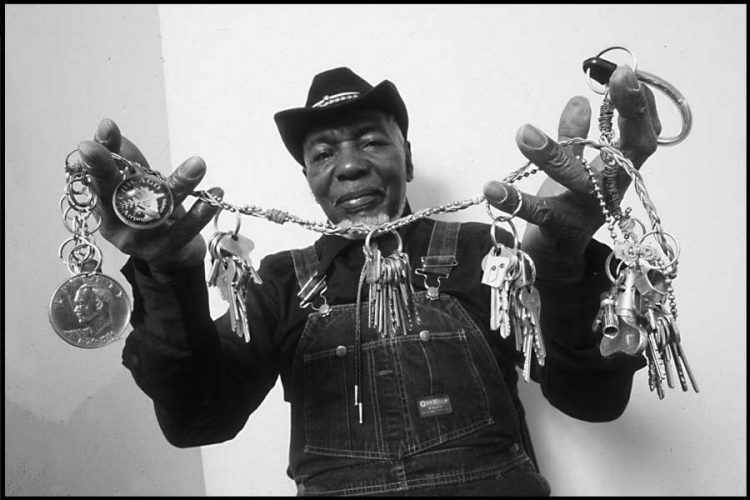 Frank “Little Sonny” Scott Jr. strung groups of keys together and, according to their pitch, “played” them at the Maxwell Street Market as a musical instrument using the notes E through C on the musical scale. This photo of Frank showing his keys was taken against the west wall of his apartment. All images published by the Maxwell Street Foundation within this website are copyright of the artist and are for educational, personal, and/or noncommercial use only. For any other use, please contact gro.n1555621877oitad1555621877nuoft1555621877eerts1555621877llewx1555621877am@of1555621877ni1555621877.